A westbound car lane will be added back to Playa Del Rey's Culver and Jefferson Boulevards through the Ballona Wetlands. Photo by Joe Linton/Streetsblog L.A.
Two days ago, L.A. City Councilmember Mike Bonin announced that the city of L.A. will be scaling back more of the Playa Del Rey safety improvements implemented in June. The city will add back a westbound car lane to 1.1 miles of Jefferson and Culver Boulevards. We’re restoring the second westbound traffic lane on Culver and Jefferson, while preserving an area of the road to keep cyclists and pedestrians on the street safe from traffic. I’m excited to announce that today, the Community Task Force I convened to make recommendations for how we can improve street safety in Playa del Rey while minimizing traffic impacts reached a consensus agreement to recommend an immediate restoration of the second westbound traffic lane on Jefferson and Culver. This will be as an interim measure to relieve traffic congestion while the task force continues to deliberate a more comprehensive and permanent solution that will keep people safe in Playa del Rey. The interim consensus agreement also retains the present configuration in downtown PDR, between Vista Del Mar and Nicholson. The plan was approved after the task force listened to the concerns of small businesses in Playa del Rey regarding increased traffic, and I’m very proud of the hard work that advocates, neighbors, and business leaders on all sides of this issue have done to come to consensus on provide this quick relief to PdR businesses. This sort of buy-in from the community was what this entire Safe Streets for Playa del Rey process has been about, and I’m excited to see it progress. 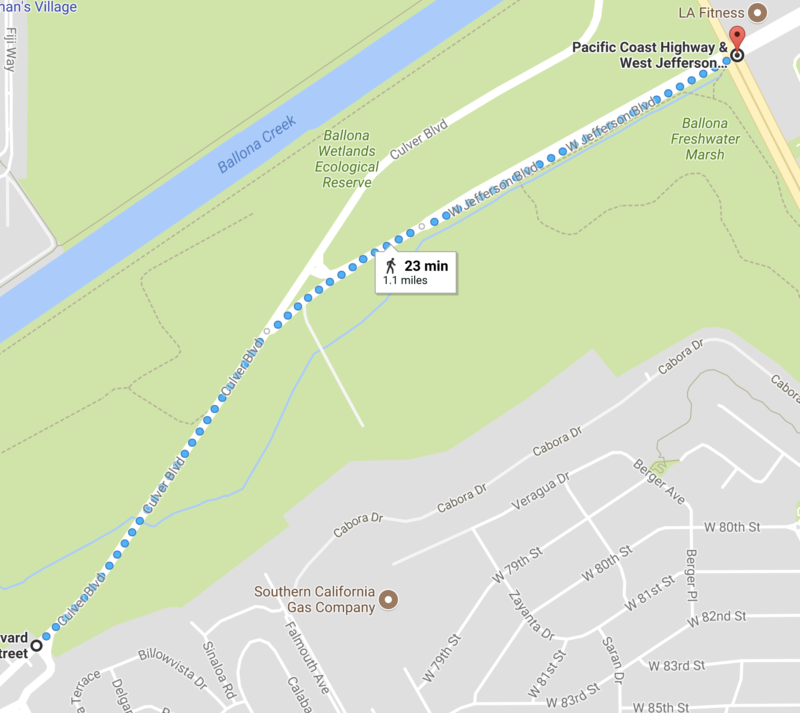 Within the next few weeks, crews from LADOT will re-stripe westbound Jefferson and Culver to relieve traffic heading into Playa del Rey while preserving a protected shoulder area on the roads for pedestrians and cyclists to share. As mentioned by Bonin, the road diet configuration remains intact on Culver Boulevard through the commercial portion of downtown Playa Del Rey, as do the Pershing Drive improvements. In response to a litigious and raucous driver backlash, the city already scaled back improvements on Vista Del Mar and on Culver Boulevard north of Jefferson. The Culver and Jefferson lanes being added back are located in the Ballona Wetlands Ecological Reserve. Environmental advocate Marcia Hanscom warns that adding lanes through the wetlands means higher car traffic volumes and speeds likely resulting in wildlife roadkill numbers going up. Hanscom has been a vocal supporter of the Playa Del Rey traffic calming improvements as an antidote to Ballona Wetlands roadkill which are “an order of magnitude” higher than at any other southern California wildlife reserve according to studies by Cal State Channel Islands professor Sean Anderson. The Times reports that Bonin’s community task force is expected to make its final recommendations in November. The anti car zealots want the streets of west la to be conquered by their slow moving bye – cycles. This videos shows what happens. Cyclists rampaging everywhere – utter chaos. Innocent Cars forced to slow down !!! Marcia Hanscom is not a reliable source and should not be quoted. She has not been forthcoming with accurate information and has spread rumors and innuendo about the residents and business communities of Playa del Rey. So Mike’s own community task force which is lopsided in favor of road diets is recommending to undo the road diet. And how much is this going to cost us? This is why it is better to be honest about what you are doing, get real community feedback and do studies to find out the negative consequences BEFORE you implement the changes. This is the greatest example of Poe’s Law I have ever seen. Bravo whichever side you may be on! It’s such good Poe’s Law that I was legitimately unsure whether or not these videos were serious the first time I saw a couple of them. I’m assuming they’re not? Do you know for sure? It was always stated to be a “trial.” If everyone hadn’t FREAKED the hell out and given the configurations a chance to see what worked and what didn’t, we wouldn’t have been in this divided position here in PDR. This solution placates a very noisy and well-funded few who use our community for a freeway as they commute from their beautiful beach cities to West LA. We have freeways! PDR needs the same attention to cultivate its beach use, walking and bike access, and the appreciation of the wetlands. We have the one amazing hotel, Inn at Playa Del Rey, and may wonderful businesses along Culver and Pershing.We host the last coastal wetlands preserving many animals. Do you even know who lives there?? I wonder what the area would be like if traffic were not whizzing by? Maybe Sunset magazine, The Los Angeles Times, Coastal Living, and other travel magazines would begin to take notice of us instead of skipping from Marina del Rey to Manhattan Beach in their coverage of beach towns. This new development is short sighted and NOT in the best interests of Playa del Rey. Too bad people on both sides have completely missed that our traffic congestion is a result of decades of underpricing the road network. Implement congestion-based road pricing, a truly capitalist idea, and you will end congestion. It will also result is better development choices by cities as they would be disincentivized to increase density and cause transportation prices to increase. Stop the soviet breadline treatment of the road network, it’s underpriced, there’s a shortage, and everyone lines up.